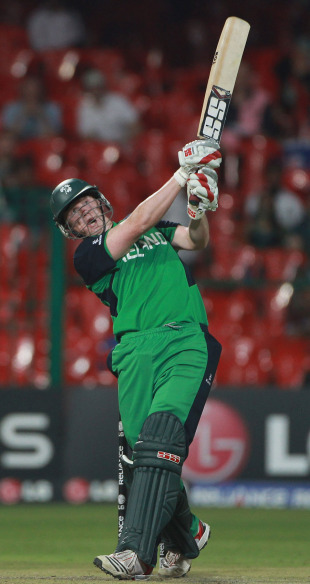 Kevin O'Brien, the Ireland allrounder who struck a record-breaking century to set up a historic win over England at the World Cup, has scored two domestic contracts that will keep him busy this summer. O'Brien, 27, has been signed by Gloucestershire for the remainder of the English domestic season, barring approximately 18 days he will spend playing in the inaugural Sri Lanka Premier League Tournament between late July and early August. ''I am very excited to have the opportunity to play for Gloucestershire, and work under one of the most successful coaches in domestic one day history," said O'Brien. "I am looking forward to getting over there and hopefully helping the team to achieve its goals in all forms of the game, but especially Twenty20 and one-day cricket. "We are delighted to have signed Kevin O'Brien to our squad with particular reference to his one day skills," added John Bracewell, Gloucestershire's Director of Cricket. "Given his heroics in the World Cup the Gladiators have a genuine lion slayer in their midst." O'Brien will join Gloucestershire's squad the squad later this week and should be available for the match against Glamorgan on Sunday May 15. There remains some uncertainty over who he will be playing for in Sri Lanka, where the seven teams taking part will be drawn from Basnahira, Kandurata, Nagenahira, Ruhuna, Uthura, Uva and Wayamba, but O'Brien has some clues as to who his team-mates will be. "I'm still not 100% who I'll be playing for in Sri Lanka, although I have been told that Sanath Jayasuria will be the team's captain, and that Darren Bravo and lonwabo Tsotosbe will also be on the team," he said. "The opportunity actually came through Phil Simmons, who forwarded me an e-mail a while back, and subsequently Somerset Entertainment Ventures approached me. It's going to be a magnificent experience, and hopefully I'll acquit myself well in what's sure to be a terrific tournament." All the games in that competition will be played the R Premadasa Stadium in Colombo and the winner of the tournament will qualify for the Champions League Twenty20. The league will be run by the Singapore-based Somerset Entertainment, which has bought the rights for five years. O'Brien, who normally spends his summers playing for Railway Union Cricket Club in Ireland, made his one-day international debut in 2006 in Ireland's inaugural ODI, and his international Twenty20 debut followed in 2008. He played for Nottinghamshire in 2009, and in 2010 was awarded a contract with Cricket Ireland, making him one of six players with a full-time contract with the board. He has scored 1534 runs in 58 ODIs to date at an average of 34.86 and has also taken 47 wickets, putting him near the top of Ireland's record lists for both batting and bowling in ODIs. Kevin's brother Niall is a regular for Northamptonshire, and although the two won't have a chance to compete during Northamptonshire's trip to Bristol from May 11 to 14, they could well meet as opponents in Northants' final four-day game of the season in mid-September, or in the latter stages of one of the limited-overs competitions.